If you’ve never meal prepped before, it can be time consuming and overwhelming. I’m sharing 3 ways to make meal prep a bit easier for you! You can use one or all of these tips to reduce the amount of time it takes to prepare. Plus, these shortcuts are tools that I use myself to make meal prep a bit less stressful! This post is sponsored by Al Fresco All Natural Chicken Sausage which is a great solution for simple meal prep! 1. Don't worry about the entire week at once! Start with one breakfast, one lunch, & one dinner. Usually, it will make enough portions to last 3-4 days. 2. It is OKAY to use frozen, canned or pre-cut vegetables! If it is going to take the pressure off cutting every veggie from scratch, utilize some shortcuts when you're starting out! 3. Skip cooking the proteins. An amazing way to save time is the utilize some of the incredible pre-cooked protein options out there, like these @alfrescochicken meatballs, sweet italian chicken sausages & country style breakfast chicken sausage! They're super flavorful and make for the perfect addition to an easy meal prep! I'm always sharing beautiful meal preps from my business, Meal Prep Chef, where we make everything from scratch. But if you've never meal prepped before or are a beginner in the kitchen, that can be very quite a load to take on! You don’t necessarily have to make every single item from scratch. Which is exactly why I love to utilize delicious products like Al Fresco Chicken. 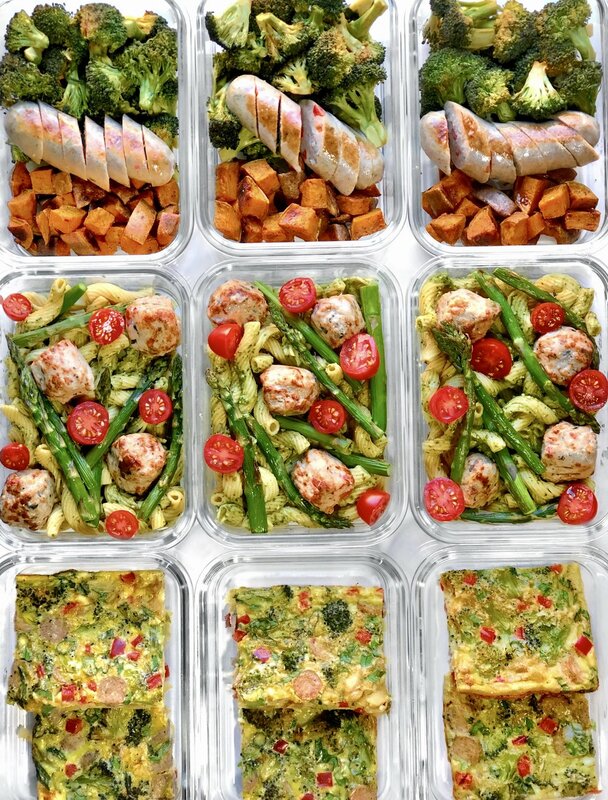 Hopefully these tips show you that meal prep IS possible with a few handy tips & products! Toss prepped Asparagus in olive oil, salt & pepper. Spread on sheetpan & roast for 15 minutes. Cook pasta in boiling water according to package instructions. Strain. In large mixing bowl, combine the pasta, asparagus, cherry tomatoes & pesto. Toss until evenly coated. Divide into 3-4 meal prep containers. Divide the chicken meatballs evenly among the containers. Store in fridge with weekly meal prep to enjoy throughout the week! California Avocado Sweet Potato "Toasts"